How Can An AV Integrator Make a Living Without Pulling Speaker Wires? Some home theater installers may hear about the WiSA Association, and instinctively ask: Without wires, how can a Value-Added Re-seller make a living selling WiSA compliant speakers? Notice, “pulling the wires through the walls and/or conduits” was only one of the tasks normally performed by the re-seller. The re-sellers are still adding value to the product and the process. They are the still the trusted experts in the field: choosing the right components for the room, delivering the equipment, placing the speakers in optimal locations, configuring the system, training the client how it works. Offer the customers the ability to upgrade their system over time, from 2.1, to 3.1, 5.1, 6.1, 7.1, 7.2 and so on. Give end-users the option to reconfigure their living rooms for special occasions, or just different furniture. If your customers move to a larger home, they can take their entire investment with them. They also don’t have to pre-wire their new home. Install high-end surround sound systems into historical rooms with ornate floors, walls, and ceilings which are often “off limits” to contractors. Move the speakers outside for an outdoor movie night. All you need is some good AC extension cords, a projector, and understanding neighbors. Churches and other houses of worship can host a teen night or family movie night in their hall or basement. The VAR can provide custom cases or covers for the speakers so they can be stored neatly when not in use. By stocking a few systems from different manufacturers as demo units, the VAR can give the client the option to “test drive” different speaker models before making the final decision of which ones to purchase. Instead of two installers on a residential job site for a week, a WiSA compliant system can be installed in a day. The customer will still need two guys to hang the big flat-panel TV, and setup the speakers. Just no more pulling speaker wires. Now, please raise your hand if you like pulling speaker wires. ….mmhmm… That’s what I thought. But What About Wireless Speakers? The CE (Consumer Electronics) and ProAV (Professional Audiovisual) markets have been flooded lately with wireless video solutions, from simple point-to-point wireless HDMI transmitters, to enterprise-level collaboration tools like the new miniVEOS from Wow Vision. But what about wireless speakers? Even powered loudspeakers still require a line level cable to be pulled from the source to each speaker, right? Let me introduce you to WiSA™, the Wireless Speaker and Audio Association, an industry group setting a new standard for high-performance wireless speakers. Traditionally, wireless audio has had a bad reputation, because most wireless audio technology uses the 2.4 GHz spectrum commonly #occupied by other consumer electronics. The result is dropouts and poor audio quality due to the “reduce to fit into 16-bit” compression algorithms needed to compete in such hostile wireless environments. Conversely, WiSA™ uses spread spectrum technology from Summit Semiconductor in the 5 GHz Unlicensed National Information Infrastructure (U-NII) frequency band. This avoids interference by other consumer wireless devices. The result is audiophile-quality, 24-bit surround sound, with virtually no lag. 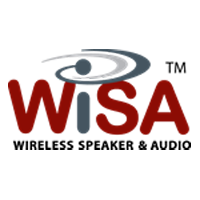 According to a December 2011 press release, “The Wireless Speaker and Audio (WiSA™) Association was launched … to advance the adoption of wirelessly transmitted high-definition (HD) surround-sound audio in the home theater environment by establishing the industry’s first interoperability specification and certification testing programs for manufacturers of high-performance wireless speakers, DTVs, Blu-ray Disc players, and other consumer electronics (CE) devices. Aperion Audio, DEI Holdings, Inc. (parent company to Polk® Audio and Definitive Technology), Hansong Electronics Co., Klipsch® Group, Inc., Meiloon Industrial Co., Pioneer Corporation, SHARP Corporation, Silicon Image and Summit Semiconductor signed Letters of Intent to join the WiSA Association as Advisory Board members to promote interoperability of interference-free, wireless surround-sound audio across a wide range of consumer electronics devices. ” Sweet. We all know at least one room that has begged for wireless speakers, let’s start with your own home theater systems. Even if your living room has been pre-wired for surround sound, is it 5.1, 6.1, or 7.1? Are the speakers located where you actually want them? With WiSA™ wireless speaker technology, you are not limited by your speaker wires. If you want to completely reorient the room, and flip it by 180 degrees, you can. Since the WiSA™ speakers have built-in amplifiers, you will need to plug each speaker into a local power outlet, but that’s typically a lot easier than pulling speaker wires through walls, around the chimney, or under the floor, in the crawl space. Now let’s put home theater applications aside, and think of some larger applications where WiSA™ wireless speaker technology could be used. What about a Church that wants to start having a weekly movie night for teens in their sanctuary? You could have a projector and WiSA™ -enabled surround sound receiver on a portable cart. Then, just roll down the projection screen, carefully place the WiSA™ speakers around the edges of the room, and plug them into local power outlets. No need to worry about complicated programming, or teens tripping over the speaker wires, just turn it on and you are good to go. You could use the same portable setup for a high school gymnasium, or an outdoor movie night. Or how about that new Executive Breifing Center (EBC) in Silicon Valley, that will have 4 walls made of glass, and no finished ceiling? (I wish I was kidding) Or maybe in that old Ivy League classroom where you are not allowed to touch the ornate ceiling, or the wooden walls, or core the floors? We have all begged for wireless speakers at some point, and I’m sure we can all think of commercial uses for them. Yes folks, the year of wireless AV is here; and 7.1 surround sound audio is included.